Bonjour! 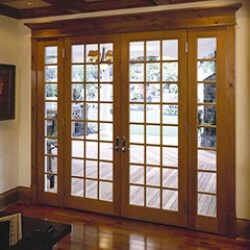 Make your home as elegant as a Parisian with beautiful french doors. Maximizes space with the ability to open into a room or outward to best fit your home's layout. Our real wood french doors come in almost any configuration, any size, any wood species, and on a variety of jamb styles, from singles to quads, inswing and outswing, single lite and multi lite.